Do you have a group of travelers looking to achieve a higher state of zen? Perhaps a wellness retreat to one of our stunning destinations in Mexico or the Caribbean will do the trick! Use our personalized services to send your body on a holiday, with travel coordination arranged for your group by a dedicated agent, so you can get to relaxing in paradise sooner. We’re also dedicated to making sure you get the right price too, so you can find that perfect location for any budget, big or small. Since we specialize in groups of 10 and up, we can find that perfect all-inclusive resort were your group will be welcomed with open arms. All drinks and food are included with the cost of the room. 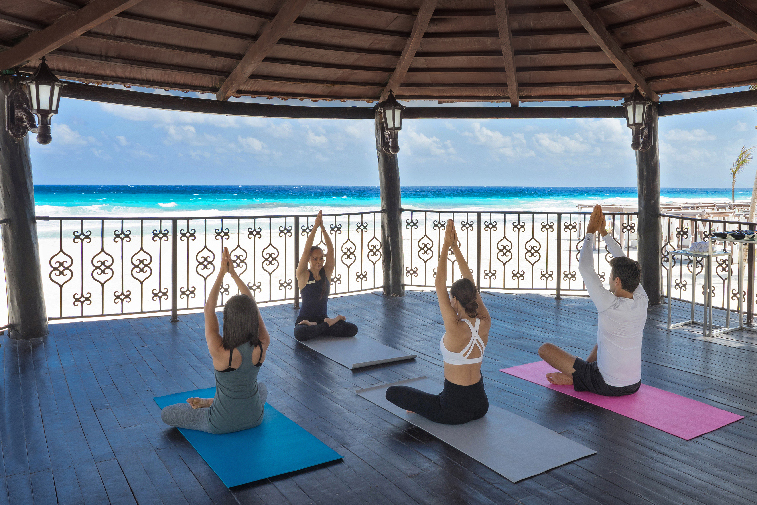 We can find resorts that feature everything you’ll need from event spaces for yoga lessons and seminars to lush outdoor venues and outstanding fitness facilities to make the retreat a standout success. Many of our resorts even feature discounts and exclusive perks if your group meets a certain set of requirements. These perks can include everything from free private events to room upgrades and more. Our resorts even feature built-in activities that range from free snorkeling and paddleboarding to daily water aerobics classes, group meditations, and morning yoga sessions taught by certified professionals. Since we work with large groups we can find discounts at many of the resorts we feature. These discounts may be based on the size of your group traveling. With low deposits, every member of your group can secure their room up front at a low lock-in rate. They can then create payment plans with their agent, setting up easily affordable payments. Your yoga or wellness group receives their own custom website. There you’ll find resort information, room categories, and even be able to pay your deposit and payments directly. Group leaders can even add itineraries for the week there! Are you the one organizing your wellness vacation? Some hotels offer amazing perks for group leaders, the ones who gather their groups together. These perks range from resort credits to room upgrades, all the way up to an entirely free trip!